Scarce imaginative 1650 plan of Jerusalem. 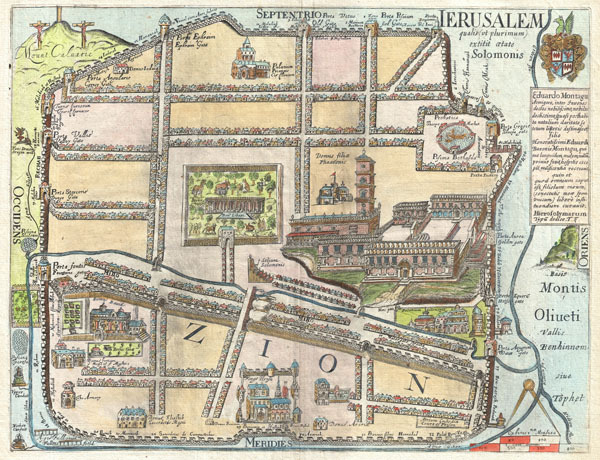 An extremely rare and altogether fascinating 1650 map of Jerusalem by Thomas Fuller. Depicts the old walled city of Jerusalem during the reign of the Biblical King Solomon, ca. 961-922 BC. On the whole this is a highly imaginative map of the city and likely bears no significant resemblance to the Jerusalem of Solomon. Solomon's Temple appears at the right center with a tall bell tower and a highly Renaissance European design aesthetic. At the center, roughly where the Church of Holy Sepulture is located today, is Solomon's menagerie. The Baths of Bethesda, in which an angel swims, appear in the upper right, approximately where they are said to be today. Other sites of note include 'Domus David' near the modern day Jaffa Gate, the armory in the lower left, the Kings House at bottom center, Solomon's throne near the menagerie at center, the golden gate at right center, etc. Throughout the streets are arranged with an uncanny geometric precisions. Outside the walls Fuller identifies the Mount of Olives (Montis Oliueti), the Dragon Well, the Fullers Field, the King's Garden, and despite purportedly being a map of Solomon's Jerusalem, the Crucifixion on Calvary. A armorial crest and a dedication to Eduardo Montagu, or Edward Montagu, the First Earl of Sandwich, appears in the upper right quadrant. Engraved by John Williams for the 1650 first edition of Thomas Fuller's A Pisgah-sight of Palestine. This map is exceptionally rare and an important addition to any serious Israel - Palestine - Holy Land collection. We have found no record of it appearing on the market in the last 10 years. Following an illustrious career, Fuller contracted Typhus fever and died at his home in Covent Garden on the 16th of August, 1661. Fuller was survived by several children from his two marriages. Fuller, Thomas, Pisgah-Sight Of Palestine And The Confines Thereof, With The History of the Old and New Testament acted thereon., 1650. Very good condition. Original centerfold. Minor darkening lower left quadrant. Laor, E., Maps of the Holy Land: Cartobibliography of Printed Maps, 1475 - 1900, 1024. The George Washington University, The Gelman Library, Special Collections Research Center, MAP0002.